Image caption Parents whose children did not get a school place campaigned to "raise awareness of the incompetence of the county council to let this happen"
All Hertfordshire pupils without a secondary school place for September have been offered one after two schools agreed to increase their intake. The county council was unable to offer a place to 189 children in the first round of allocations. Both Samuel Ryder Academy and Townsend Church of England School in St Albans agreed to an over-allocation, the council said. One affected parent have said this was "not a long-term solution". Hertfordshire County Council said a "bulge year" for births in 2007-08 meant it had 460 more applications this year than last year. 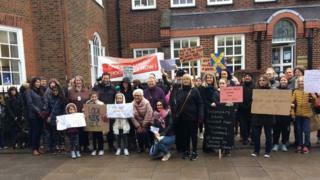 When pupils were left without a place, the authority said the main issue was that the funding allocation from government for the new Katherine Warington School, being built in Harpenden, came in too late for the school to be included in the council's co-ordinated application process. A separate application form had to be filled in for this school in a parallel process and as a result duplicate places were allocated. After the second round of allocations, Terry Douris, Conservative cabinet member for education, said he was "pleased to say that, as expected, all Hertfordshire children have now been offered a school place". Of the 189 children without a place, 115 have been given a school on their list of preferences and 74 have received a place not on their preferred list. The authority said places in Harpenden did become available due to the duplicate offers being removed and other factors but in addition, Samuel Ryder Academy agreed to admit an extra 25 children and Townsend School agreed to an over-allocation. St Albans parent Josie Madoc, whose daughter Seren, 10, was affected, said: "Even with Katherine Warrington... actually they still needed to increase intake at other schools. "It's not a long-term solution, as the forecast shows that over the next few years, the divide between places needed and places available will continue to grow even bigger. "St Albans needs a new secondary school, and that must be the next campaign." Secondary school places - not got what you wanted?